Why do rafters crack? Relating the story of what a client heard that caused them concern, and how the idea behind the cause was developed. As you are aware, most home inspections are connected with the buying and selling of property. You may not know that home inspectors are called upon for other issues too. I thought that one particular job warranted reporting, since the process may help homeowners understand how to discover the cause for their own mystery. In this case we are dealing with strange sounds, shaking chandeliers, and a cracked roof rafter, so let me tell you the story from the beginning. I had a call that started out as a roof inspection. The caller said that they had a problem, but they were not sure what may be happening. They trusted me, and wanted me to give them a full report on the condition of the roof. I arrived at the home, where I obtained further details. This part of the investigation really gives many clues, but I find that homeowners will jump to a conclusion. You have to find a way to distance yourself from the story to observe the facts. The homeowner reported that his mother-in-law had heard someone chopping through the roof. She was terrified, yet when they came home, there were no signs of any roof damage, so they dismissed her fears. A few days later, the mother-in-law and her daughter were sitting in the back room, when they heard a sound and the chandelier shook violently. They felt the first incident could not be ignored, so they felt that this must be connected with the roof. The chopping sound occurred in the dining room. The next room down had the chandelier. The back room is an addition to the original house. I went up on the roof. The family felt that maube something had fallen on it. I found issues, but nothing that would explain the story. At this point, I should note that we had some wind gusts which have knocked off large limbs from trees. Flying objects could have been hitting the roof. I found none of the marks that an object hit the roof with such force. I did find that shingles from another roof had flown onto their roof though. I took my pictures of the issue areas, and wrote down my findings. The next part of any roof inspection is going into the attic to see the underside of the roof. The attic on a hot day is no fun adventure.The cramp space with the heat discourages most homeowners from really exploring this space. Some facts about this attic: much of the space does not provide much headroom; the ducts from the air conditioning block your views; a silver radiant barrier paint had been applied to the underside of the roof after a fire; different remodeling projects inside the house had changed the configuration of the attic. I bring up the space issue with the ducts, because these factors cause a homeowner to only stay around the landing area in the attic (some home inspectors do the same). To understand the problem, you have to move through the space, which means getting dirty and sweaty. The next factor is the remodeling, and you will need to understand what was done. The homeowner raised the ceiling in various rooms to help create a more open space. This is accomplished by removing old ceiling joists to frame the new higher ceiling. The addition on the rear of the home has a lower roof. Sometimes remodelers simply attach onto the the home without connecting the attics with a small hole for ducts and wiring. This was not the case in this home. The new attic space was fully open to the old attic. The paint will help provide a clue as well. I crawl towards the back of the home, since the attic entrance is towards the front. I actually move to the rear twice. The air conditioing system is paced in the middle of the home’s attic, and the unit divided the space. I wanted to see everything, so I went down the side where I was not able to see the attic over the main space I wanted to study. In the area of the chandelier below, I notice that purlins (these are the supports that connect rafter to joist) have been cut. I am not sure for which remodeling job, but I knew that both remodels happened many years earlier. I began to examine the framing, whereupon I found a small crack in a roof rafter. Examining the next rafter down, I saw signs of a crack there as well. My view of the dining room portion of the attic was blocked by ducts. I crawled underneath them back towards the dining room. There was a rafter that was splitting in two. Here the paint plays a role. If the rafter had split before the paint was applied, we would see paint in the crack. Next, looking at the wood inside the crack, we would expect it to become darker as it is exposed to the attic environment. This takes many years, but the interior wood did not look like it had been exposed too long. I have spoken to contractors that tell me they can determine the age of a crack or a burn mark from looking at it. If they tell you this, they are not being honest. I do not know when that crack happened, so my story is not over. Moving back to the attic entrance, I examine the point where the rafters attach to the ridge beam (this is the beam at the top of the roof). I see that on the side of the home that has the cracked rafter has the nails exposed (basically you will see a gap between rafter and ridge beam). This happens in new construction as well, so in and of itself, this is not alarming. The paint provided another clue here. Part of the nails were paited, but I could see that about a half inch of exposed nail was not painted. Another clue was that there was no rust on the nail. No paint means that the rafters on that side have pulled away from the ridge beam after the attic had been painted. No rust indicates that the movement had all been in one direction, which means the movement happened more recently. The picture was forming. In the home, I began to talk to the homeowners about my findings as I examined the area below the cracked rafters. I noticed that the floor by the entrance to the addition was bumped up. The owner talked about a plumbing problem tat caused a leak under the foundation. This would cause a bump up. As I began to talk more about the fact that there may be a foundation problem, they mentioned that cracks were appearing, and that older cracks were opening up again. They had been noticing this for the past few months. Now I had all the pieces to the puzzle. So why did the rafters crack? There is no simple answer. I could have stopped with the cut purlins, and said that is it. Here is my conclusion: the water leak caused the expansive clay soil to push the foundation up in the middle part of the house. After the repair, the foundation will sink as the soil dries out. In the mean time, the soil movement has already caused problems for the foundation resulting in the observed cracks. The movement in the foundation is placing stress on the framing, causing the rafter to move. Since the bracing structure of the framing (the purlins) had been removed due to the remodels, more stress was placed on the rafters at the point where the braces should have been. This stress leads to the crack. The chopping sound was the rafter beginning to split. The shaking chandelier was caused by more cracking (maybe the three rafters at once). The solution means more than rafter repair. The situation with the foundation could continue, so that should be repired. 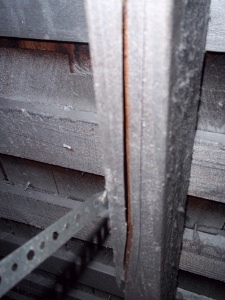 The rafter needs to be repaired, which could mean sistering another rafter to the first (sistering is attaching another wood beam to the original in order to strengthen it). Then new purlins have to be installed. Pleasures of owning a home right? One lesson here is that you have to check on the work of the remodeler. Builders do not add extra framing, because they think that would be fun. Every piece of framing has a purpose. Removing some framing without replacing it does not make sense. The next lesson is to treat the house as a whole. There are problems which have nothing to do with anything else, but this case shows that we do have problems which may be inter-related. You see, a home inspector may be worth the money, he says smiling. This entry was posted on Monday, June 27th, 2011 at 2:30 pm	and is filed under For the Homeowner. You can follow any responses to this entry through the RSS 2.0 feed.